We arrived on the Sunday to find our accommodation in Beer. Two well equipped cottages just off the high street. The hall was around the corner, but a window into a back room of the hall backed onto the cottages. Sewing machines, buckets of soda and salt, and much more was passed through the window! Six o’clock came and time for supper at the Anchor Inn on the seafront. 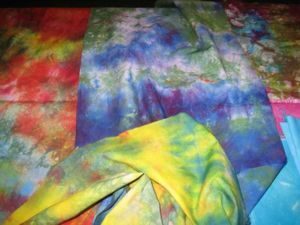 Monday morning was dyeing day – more equipment has passed through the window, and we started dyeing fabric in various ways. Jean Bartlett provided a wonderful lunch of soup with bread, before more dyeing in jars and bags. At the end of the day we had to empty the jars and bags down the drain outside and then the rinsing, washing and ironing began, which continued well into Tuesday evening. Tuesday began with deciding what picture each of us was going to make, materials were selected from yesterday’s dyed fabric and the base of the wall hanging was completed. This was only interrupted by a succulent chicken salad and fresh fruit lunch. 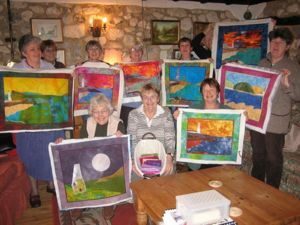 On Wednesday the hall was unavailable in the morning, so some went shopping at the new quilt shop in Axminster and some hand appliquéd with Patricia. During the afternoon more machine appliqué and borders with mitred corners were applied, expertly guided by Patricia. The day ended with a take-away curry and homemade bread and butter pudding. Some people started the next day with a walk to view the wrecked ship Napoli, and then we shared the hall with a local coffee morning group, and more information about the ship. Borders were cut and attached and free machine embroidery / quilting was demonstrated and students progressed with their wall hangings. Then it was time to clear the hall, as we were moving all machines etc into Hope cottage through the window for the last time an excellent supper at the Anchor Inn was enjoyed by all and Jean Bartlett came and joined us. Tables were erected and sofas turned on end and our last day began in Hope cottage sitting room. What a good week was had by all. PS. A lot of laughing and sewing did happen. Thank you Patricia for a wonderful week. Tim Jean’s husband was surprised to hear this might be an annual event, it didn’t surprise any of us and we talked about the possibility of the next one.